Managing your compost pile properly sometimes requires some trouble shooting. In general, you should be monitoring temperature, moisture content, C:N ratio, odour, and insect populations. If anything seems suspect, consult the following table for symptoms, possible explanations and solutions. If your problem does not appear below, please don’t hesitate to contact a regional Manure Maven or take a look at our Land Management Guide. Below is a list of various symptoms associated with compost functioning and the possible causes and solutions associated with those symptoms. If your pile is left uncovered and gets rained on, or you add too much water to your pile you will decrease the airflow in your pile by filling up the pore spaces with water. This will significantly slow decomposition of the pile and can cause odour issues to occur. If you find that your pile is too wet you should turn the pile so that air will be reintroduced into the system and air drying can occur. If the pile is extremely wet, it may be advisable to add dry material such as straw, sawdust, or finished compost to take up excess moisture. If your pile is covered (and it should be) then it will occasionally need the addition of water to keep it composting. 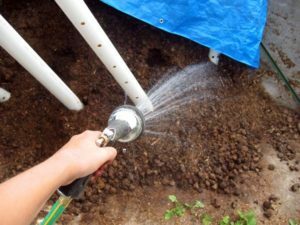 During months with higher temperatures, regular watering may be necessary. If your pile becomes too dry, microorganisms needed for decomposition to occur may dry out or will not be able to decompose materials efficiently as water is required for them to utilize organic materials. When adding moisture to a dry pile it is important to continuously check the moisture content of the middle of the pile to make sure you do not over or under water. It is best to add water in small increments to ensure you do not add too much and to allow water on the surface to soak into the pile. Moisture can also be added to stall and paddock pickings before you add them to you compost system as optimum moisture content of raw materials should be 50-60%. By ensuring this moisture content for each addition to your system you will help with even moisture distribution throughout the pile and will achieve better composting. The optimal temperature range for compost systems is between 32 C and 60 C (90 and 140 F). The temperature of compost systems can easily become higher than the optimum range stated above. It is important to carefully monitor the temperature of your system as temperatures greater than optimum can reduce the activity of many of the microorganisms involved in decomposition and in extreme cases can be a fire hazard. See the troubleshooting guide at the end of the guide if your pile has high temperatures. 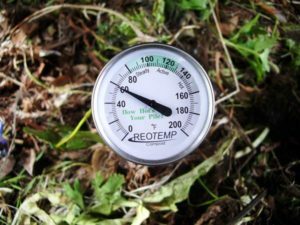 There are times when compost system temperatures are lower than optimum. Low temperature is an indication that there is decreased or no decomposition occurring in the compost pile. Low temperature is an indicator that your compost is finished, but if it does not appear to be finished, your pile may have other management issues. See the troubleshooting guide at the end of the guide if your pile is failing to heat. The temperature of compost systems varies throughout the composting process. At the beginning, significant temperature increase can occur within hours of forming the pile, indicating rapid breakdown of materials. Temperatures will remain high for several weeks as microorganisms break down organic material and will gradually drop to air temperature as the compost finishes and becomes stabilized. Below is a diagram of compost temperature variation over time.